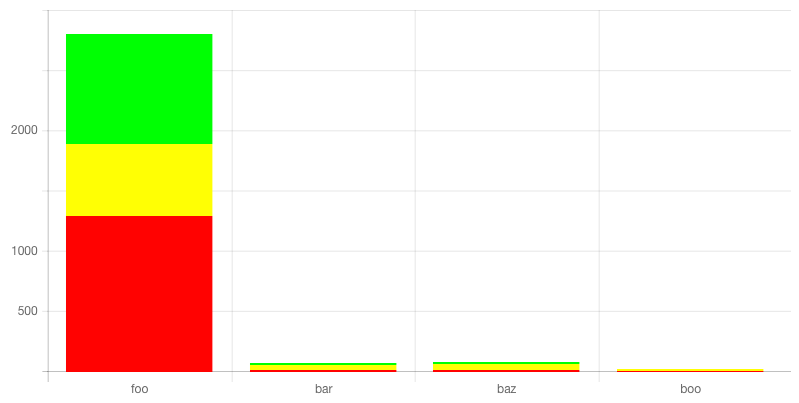 As you can see the entire point of visualization got lost as it's impossible to differentiate between bar & baz values. Do you have any experience with such cases? As others have suggested, I'd suggest using logarithmic scales. You can see and interact with it here. Full disclosure: I'm on the ZingChart team. Holler at me or email us at support@zingchart.com if you have any questions. 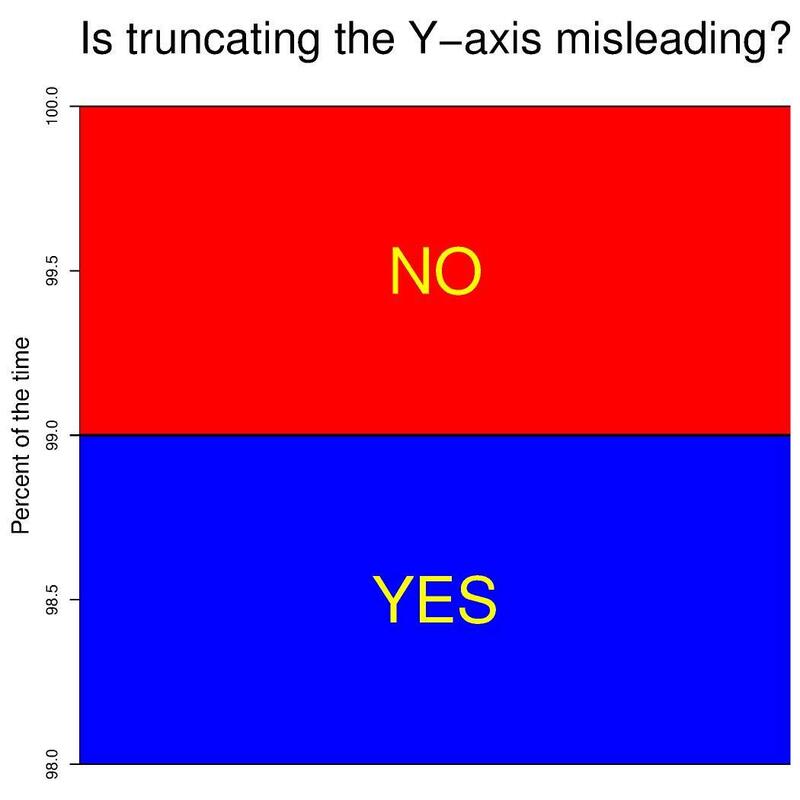 How about discontinuing the y-axis, don't remember what the technique is called so couldn't find any image. It involves using the saw line cutting the y-axis so that below the saw line, in your case, could be values from 0 to 100 and above from 500 upwards. Grid lines should be differenty spaced above and below the saw line. What do you want to visualize? 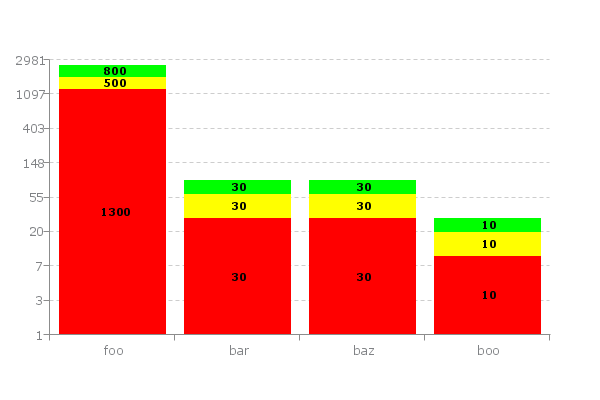 If you want to visualize the proportions between Foo, Bar, Baz and Boo, the image you attached will do fine. 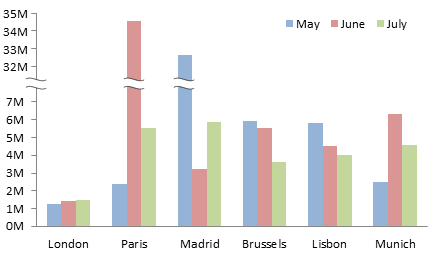 If, however, you want to visualize the proportions within a bar, four separate charts (with each its own axis) would do a better job. You could also use one chart to visualize the proportions between the bars and four other charts to visualize the proportions within the bars, pie charts for example. If you really need to visualize it all in only one chart, you could indeed consider an logarithmic y-axis, although this is much more difficult to read and maybe not the best way for showing the proportions within a bar. I would generally advice against breaking axis because this kinda defies the purpose of visualization. You're breaking the proportion you're visualizing so what's the point of visualizing it in the first place? Not the answer you're looking for? Browse other questions tagged info-visualisation charts or ask your own question. How to show related data together in one diagram? How to let the user know that we have not enough data to render chart?